English Speaking Official Local Guide and Transportation in fully-equipped vehicle. 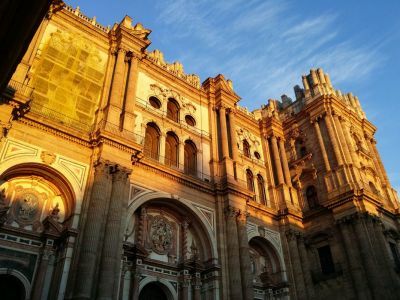 Explore Malaga's Cathedral and Castle, two of the most imporant buildings in the city. Discover where Picasso was born and enjoy the Picasso Birthplace Museum, where you can find some of his paintings. Inhabited for more than 2,000 years by different Mediterranean civilizations, Malaga is today a city which combines tradition and modernity. If you think the Costa del Sol is soulless, you clearly haven’t been to Málaga. Loaded with history and brimming with a youthful vigour that proudly acknowledges its multi-layered past, the city that gave the world Picasso has transformed itself in spectacular fashion, with half a dozen new art galleries, a radically rethought port area and a nascent art district called Soho. Not that Málaga was ever lacking in energy: the Spanish-to-the-core bar scene could put bags under the eyes of an insomniac madrileño, while the food culture encompasses both Michelin stars and tastefully tatty fish shacks. Malaga Cathedral better known as La Manquita, since one of the towers was never finished. The interior is in the Renaissance style of the 16th century, while the main facade belongs to the 18th century baroque style. Adjacent to the Cathedral is the birthplace of Pablo Picasso the city´s famous son and there are several galleries showing his work, including the 16th century Museum of Fine Arts. Today it is an archive of his life and works and open to the public. The "Casa Natal" or birthplace of the world famous artist Pablo Ruiz Picasso has been an official heritage site since 1983. It is situated in Plaza de la Merced, in the heart of the historic centre of Malaga. The area is surrounded by monuments from Malaga's rich past such as the Roman Theatre, Gibralfaro Castle with its breathtaking views over the city, as well as the Alcazaba, an Arabian fort which is now home to the Archaeological Museum. It is also just a couple of minutes walk from Malaga Cathedral and literally round the corner from the well known Cervantes Theatre and not far from the larger Picasso Museum. Built in 1861, Picasso's father, José Ruiz Blasco rented the first floor of the house from 1880 to 1883. Later they lived nearby, still in the Plaza de Merced and it was not until 1891 when Jose Ruiz is offered a job as an art teacher in La Coruña that the family moved to Galicia, where they stayed until 1895. On the ground floor is the temporary exhibition hall where you can see interesting artifacts from the beginning of Picasso's home and cultural life. The first floor has many works on show by the artist and his father, Jose Ruiz Blasco, as well as personal mementos of the Picasso family. The third floor is dedicated to the library and Research Centre, with an expansive archive of material on the artist and his work. As well as Picasso's prints and ceramics, you can see his graphic art from the period 1931 - 1971 and illustrated books. Altogether with some 3,500 examples of contemporary art exhibited by over 200 artists, including a large selection of graphic art by: Miró, Christo, Bacon, Brossa, Ernst, Tápies, Chillida, Plensa, Dokoupil, Guinovart, Matta, Moore, etc. Enjoy a half-day guided visit of the Castle of Gibralfaro, La Alcazaba, Cathedral and Picasso´s House Museum.